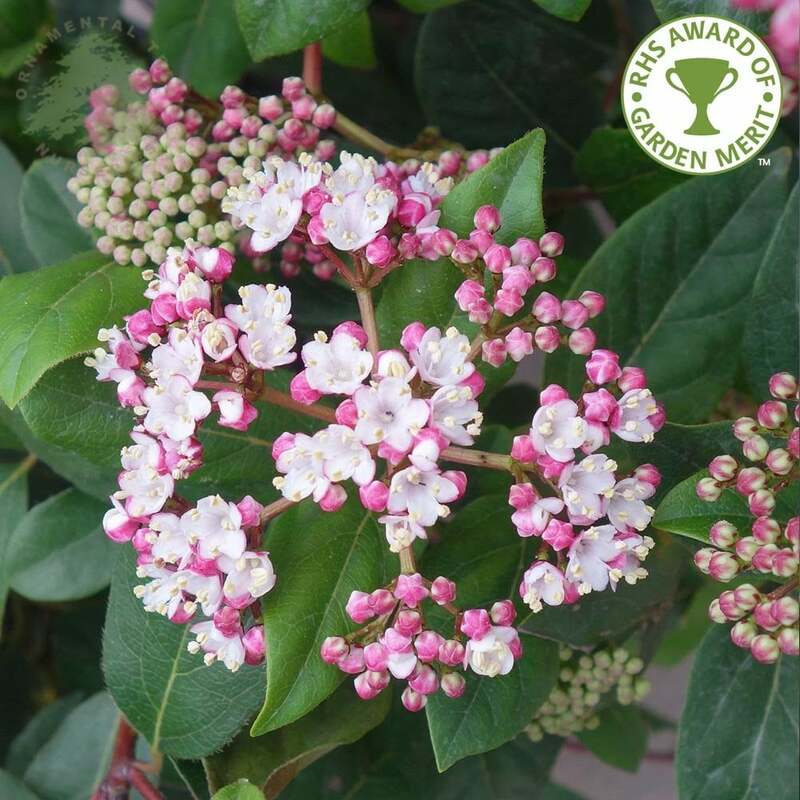 An excellent shrub for year round interest, Viburnum tinus 'Eve Price' begins with clusters of pink buds that open to small star shaped white flowers in late winter through spring. In late summer to autumn, dark blue berries appear that are enjoyed by birds. Small oval dark green leaves remain a feature all year round. It is no surprise this feature packed evergreen shrub has received the RHS Award of Garden Merit. Viburnum tinus 'Eve Price' will grow to approximately 2 x 2 metres in 20 years. This Viburnum can tolerate full sun through to shade, as well as exposed positions. Our pot grown evergreen Viburnum 'Eve Price' can be planted at any time of the year. Start by removing weeds and grass within a metre of your desired planting hole, then dig a square hole as deep as the root mass and approximately 2x as wide. To help the bush establish more effectively, sprinkle root grow in the hole. If you’re planting evergreen Viburnum in spring, summer or dry weather, water well and regularly for the first few months. Increase watering if there are extended periods of hot or dry weather. If you’re planting in autumn, you may only need to water a little. We stock a range of irrigation kits to assist watering.